Those were the words I remember hearing my oldest son’s teacher say to me in 2007 when he was in first grade having difficulty learning to read. It was shocking for me to hear this as a parent, but to hear these words as a teacher, was just as bad, if not worse. Teachers should never give up on their students. I knew my son was going to have a wasted school year, but I was determined to do something about it. Later that year, I started Parents Advocate League to help parents have a resource for their children and learn to advocate for their own children. It eventually lead me to meeting the most amazing moms, also disconnect with failure in the public school system. We endearingly and jokingly called ourselves… The Hens. In 2011, we helped found one of the most successful K-8 public charter schools in California where our kids are thriving. 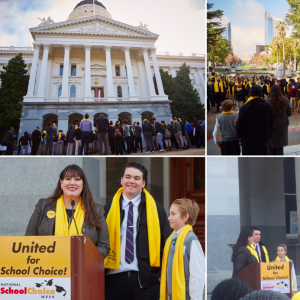 Fast forward to this photo nine years later of my boys and me at the National School Choice Week rally standing on the steps of the California State Capitol speaking about the importance of school choice in our state. This was one of the most rewarding moments of my life. Little did anyone know, I was trying to choke back tears knowing the significance of this moment standing together with both my boys. I did not let that moment, back in 2007, define the future of my children. Instead, that moment inspired me to take back my children’s education, and help create a better choice that would help students in my entire community. My hope is that parents continue to work hard for their children. Apathy is not an option when it comes to our children’s education. Vote for student-focused leaders who truly make children the number one priority in education. Listen to and assist parents who are trying to find a better solution for students. Support those great teachers who work above and beyond the limitations of their union-negotiated contract. I recently asked my son what he thought of all those years of me fighting to find a better solution for his education. He put his hand on my shoulder and said, “It is all worth it, Mom. Thank you.” His story is not over as battles continue now that he is in high school, but he knows I am there to fight for him and others as needed.